Our program is home to nationally recognized faculty, engaging classes, fantastic internship programs, opportunities for research training, and an excellent record of job placement and public service. Our program is dedicated to developing an understanding of institutions, practices, and relations that constitute public life and modes of inquiry that promote citizenship. 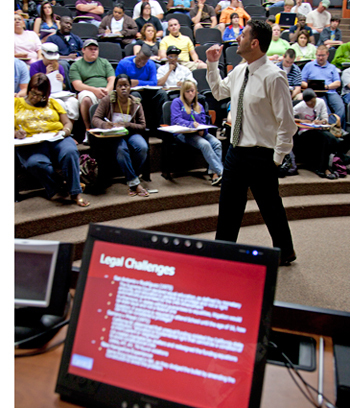 Our fields of study include law, American government and politics, international relations, and public administration. If you have any questions about Political Science, please feel free to contact Dr. Joshua Stockley, Political Science Coordinator.